One of the earliest flowering of all of the Tulips, the species, Tulipa kaufmanniana is originally from Turkestan. The beauty of these small growing tulips is the colour of the flower, the inside is different to the outside. The new flower buds are pointed, usually cream with an orange to pink, although this is variable. On sunny days when they open, the inside is a creamy white and the flowers will open fully to be almost flat. The name ‘Waterlily Tulip’ comes from the appearance of the flower when fully open. The species has been under cultivation for many years, and named varieties with stronger colour variations are available. These are an easy care tulip that do not need to be lifted every year. They grow well in the garden as long as the soil is well drained, and are also suited to growing in containers. They do need full sun to flower well, and are also low growing reaching only around 15 cm (6 inches) in height. In the garden they can be left for a number of years and will slowly multiply to form a clump. In containers we suggest repotting every 3 years as the potting soil becomes depleted. Top dress each year with a little compost and any organic type fertiliser. Growing position – Full Sun. Flowers – Pink exterior with creamy white interior, many varieties with colours from yellow to red are available. Flowering time – Late winter to early spring. Foliage – Mid green, sometimes marked. 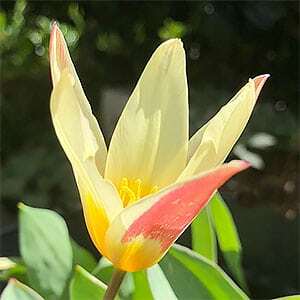 Tulipa kaufmanniana is available for sale from the following participating nurseries.